Walking into Candela, it’s obvious that the area has been hungry for another restaurant, since three months after opening the place was packed solid, even though a large fraction of the Hanover crowd was actually a few blocks away at a Dartmouth home football game. I was a little dubious that they’d be able to make a good restaurant out of the space, since most of the seating area is in a somewhat narrow L shape, but they did a good job of it. I’m still amazed they managed to fit a kitchen and that much seating in there, however. 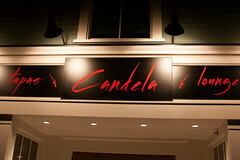 Menu-wise, Candela is primarily a tapas bar, so their menu consists primarily of Spanish-style tapas, although several other Latin American influences creep into the menu as well, including Cuban and Mexican. Quite frankly, it’s a niche that’s long been needing to be filled in Hanover, so I don’t mind the flexible interpretation of “tapas”. They also have a reasonably good Spanish wine selection, and offer flights of their more popular offerings (and their pan-Latin approach to the menu shows up in the cocktail list was well, with a variety of offerings including Mojitos and Margaritas). 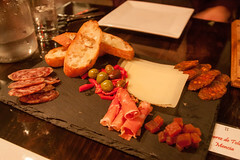 Starting off, we went for the classic Spanish-style appetizer of a charcuterie plate, with serrano ham, two types of sausage, and some Manchego cheese. We weren’t disappointed: the ham was rich and flavorful (although Spanish-style hams always make me yearn for the delectable Iberian ham we had several times in Valencia a few years ago). The cheese was flavorful, with a nice nutty note. And both of the sausages were tender and spicy. 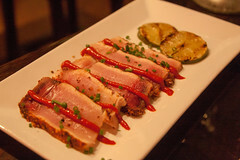 Next up was a nice tuna dish, with several slices of lightly-seared tuna served with a rich peppery Romesco-style sauce. I rather enjoyed this dish, since it really did a good job of showcasing the finer notes of the tuna. After that, we went for one of the Cuban-inspired dishes: a set of fried plantain cups filled with ropa vieja (simmered shredded beef, a Cuban classic). 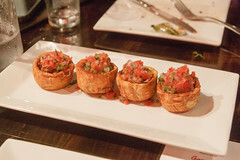 The ropa vieja was very nicely done, with tender shreds of beef in a rich tomato sauce just brimming with roasted pepper and garlic notes, and topped with a nice pico de gallo. Unfortunately, while I can see what they were trying to do with the plantain serving cups, that didn’t work: the cups were too thick, and after frying were quite frankly more than a little tough. But the actual dish was quite enjoyable, so if they can tweak this concept a bit, the results would be excellent. 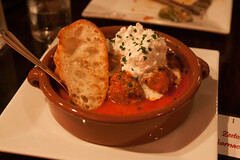 Next was a Spanish classic: albondigas. A selection of Spanish style meatballs served up in a cup of rich, thick Romesco sauce, these were perfect meatballs: the interior of the meatballs was moist and delicious, and the exterior perfectly seared. The sauce was a perfect Romesco sauce, with a moist taste that was both nutty and peppery. My only complaint about this dish? We ran out of bread and meatballs when there was still plenty of delicious sauce in the bowl that I would have loved to have sopped up with more bread. Dessert was churros. 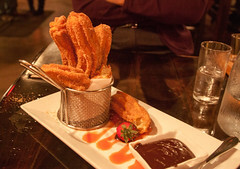 I always enjoy a good churro, but I’m always hesitant to order them at restaurants, since often they make these things in gigantic batches waiting for you to order them. Well, that wasn’t the case at Candela: $6 bought a huge platter brimming with freshly-made churros and house-made chocolate sauce. Each churro was fluffy inside, perfectly crispy on the outside, and fried with enough skill that these weren’t a grease bomb. While not healthy by any stretch of the imagination, these were one of the finest desserts I’ve had in Hanover. So, I ended up kicking myself for not coming to Candela sooner. Candela isn’t just a great addition to the Hanover dining scene, but the place is good in its own right as well, serving up a good number of flavorful Spanish and Latin American dishes. I’ll definitely be back.